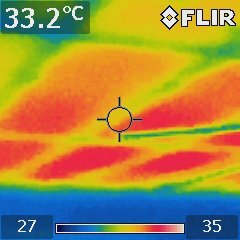 Infrared image of a tub drain leak above a finished garage ceiling. Structure: foundation, roof framing, ceiling framing, wall framing and floor framing. Attic: insulation, ventilation, evidence of leaking, evidence of deterioration. Interior: walls, ceilings, floors, windows, doors, fireplace, chimney flue portions visible from fireplace. Electrical: service drop, service entrance cable, panels, wiring, overcurrent protection. Plumbing: supply lines, waste lines, drain vents, water heater and water heater installation, water heater temperature/pressure release valve, gas water heater vent, gas piping, water meter (to determine if there is a subterranean leak between the meter and the house). Heating and Air-conditioning: gas furnace vent, gas furnace room ventilation, heating and cooling system installation, thermostat, duct work. Exterior: wall cladding, exterior trim, windows, doors, grading, driveways, walkways, yard walls, steps, decks, balconies, garage doors, chimney walls, dead trees near the house. Basement and Crawlspace: evidence of moisture penetration, crawlspace ventilation. Attic: accessible attic power vent fans (temperature permitting), whole house fans. Interior: dishwasher, range, built-in microwave, exhaust fans, disposal, oven, cooktop, trash compactor, doors, accessible windows, garage door openers, fireplace damper, gas logs. Electrical: lights, accessible outlets, spa tub motors, ground-fault circuit interrupters. Plumbing: fixtures, ejector pumps, exterior hose bibbs (hydrants), water pressure. Heating and Air Conditioning: furnace, A/C or heat pump discharge temperature (outside temperature permitting), heat pump auxiliary heating system. Basement and Crawlspace: sump pump. Condominium Inspections: A condominium inspection is similiar to a home inspection except that it is "living area only." This is because items outside of a condominium unit are typically the responsibility of the Condominium Association. Inspections are supplemented by infrared imaging. Infrared imaging detects differences in heat, and is for finding moisture and heat gain/loss. There are limitations due to site conditions (example: missing insulation isn't detectable if there is no difference between inside and outside temperatures) but it is another tool at our disposal to provide you with a thorough home inspection. Inspections follow the Standards of Practice of the American Society of Home Inspectors. However, the inspector reserves the right to exceed those standards at his discretion. 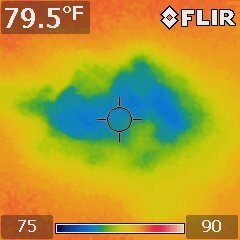 Infrared image of an interior room ceiling which is not insulated.